Su-aamee means Lord and Har means one who nourishes everything. My Lord God bha-ay has become or is boond means the raindrop; Waheguru is being personified as a raindrop. Guru Ram Das Ji says Waheguru is a rain drop and hum, I am the chatrik, the song bird. What am I doing, Guru Ram Das Ji says; bilal Billaatee - crying again and again for that raindrop. Think about this particular songbird in India, is that it can only drink via raindrop, it can’t drink from any other water. So that is why it's crying out. Guru Ram Das ji says I am that songbird crying out for the raindrop. har har, O God, kirpa Karahu means to shower your Grace upon me, bless me with your Mercy, bless me with your Grace, your blessings O Lord prabh apnee with your own Mercy, with your own apnee, Grace. mukh into my mouth; dayyhu - give me; nimkhatee – even for an minute, even for a second, an instant give me your name that will make me peaceful and give me true ecstasy. har bin reh na saka-o ik raatee. har bin – without God, reh na sako means cannot live without, ik raatee one second. Without God I cannot even live for a second, I am not alive without God. aakha Jeevan visrey mar jao Guru Nanak Dev Ji says if I am attached to God from meditating upon God I am alive, forgetting Him I am dead. ji-o bin amlai amlee mar jaa-ee hai ti-o har bin ham mar jaatee. rahaa-o. jio bin amlai amlee mar jayee hain, jio means like; bin means without, amlai means drug, amlee means drug addict, mar means to die, jayee means to and hai means has. As the drug addict cannot live without his drug, without his daily dosage, tio - in that way har bin; bin means without and har means God, ham - I, mar jaatee I die without God, without remembering God I am dead. rahao – Guru Ji says pause and think about this. tum har sarvar, tum means you, har means God, sarvar means an ocean; O God, you are the ocean. at agaah, at means the most and agaah means the deepest. An ocean that cannot even be fathomed, cannot be measured; hum means I, leh na sakahi, leh means find, na sakahi means cannot be; Cannot even find what? ant matee, matee means means even a small hint or even a trace, ant means the end. I cannot even find a small trace of your end, because you are endless. You are bay-ant, You are beyond any limit O God. O God, too you are parai parai – higher than the high, you are further than the farthest thing on this earth. aprampar- you have no limits, su-aamee O God; mit jaanhu aapan gaatee, mit means your greatness, your extent, jaanhu means to know, aapan means yours, gaatee ,eans state; You alone know your greatness O God. har kay sant janaa har japi-o gur rang chaloolai raatee. har kay sant janaa har japi-o, har kay means the Lord's sant janaa saints of the Lord, japi-o meditate upon har the Lord. The saints of the Lord meditate upon the name of the Lord. What happens to them? gur rang chaloolai raatee, raatee means to be imbued in, gur rang means Guru's color, chaloolai means deepest color. Those people who meditate upon the name of the Lord, those saints of the Lord, meditating upon the God's name are colored deeply in the Guru's love, the Guru's deepest color of love, chaloolai means the color that cannot be taken away in any shape or form. har har bhagat banee at sobhaa, har har bhagat By meditating upon God, by lovingly, devotionally, by doing Bhagti of har har of God; banee means to be created, at sobha, at means great and sobha means glory. Those people are glorified; those people are honored in the court of the Lord. 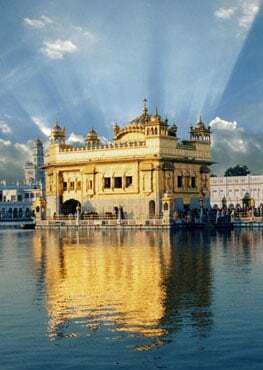 har japi-o - by meditating upon the Lord, Waheguru, what do they receive? ootam means the highest, the greatest and patee means honor. They are the most honorable people on this earth; they receive the greatest honor because they are the honor of God. We talked about this a few Hukamnamas ago when the sisters of India were being taken away in 18th century, the Sikhs who lived in jungles had nothing, went to their aid to protect them even though they didn’t know who they were. Because the man, who has God’s meditation in him, has God’s honor. He has God’s grace, he has God’s glory. He sees all as his brothers and sisters. aapay thaakur aapay sayvak aap banaavai bhaatee. aapay thakur, aapay means he himself, thakur means the Lord, aapay sayvak, aapay again means he himself, sayvak means the servant, aap bannavai bhaatee, aap means he himself, bannavai means creates, bhaatee means all different environments, all different places and all different states. He himself is the Lord, He himself is the one who serves the Lord, He himself is the one who creates the Lord and the one who created the servant. Naanak jan tumree sarnaa-ee Nanak the servant, jan means the servant, has come into your protection, sarnaa-ee means your sanctuary, your protection, tumree means yours, Guru Ram Das ji is talking to God. har rakho O har, O nourisher of the world, protect, preserve, what should God preserve us? laaj bhagaatee, laaj means honor, bhagaatee means of your beloved one, your servant, your devotee. O God, I have given up all of my anxieties, worries and everything else and I have come under your protection. Because, if we stop trying to take away our own anxieties, we will never find the end of them. Only God can remove all our anxieties. This is what Dhanaasaree Raag is saying. It is saying let God remove our anxieties. If you try to tackle them yourself, you haven’t got the capacity to deal with them. Your mind has gone through so many reincarnations, and it carries the filth of that many past lives, there is no way of erasing them without the Guru, without God and we may try again and again but through our own efforts we can’t do anything. Because aapay thakur, He himself is the servant and He himself is the master and to find Him, we must follow the Master. Guru Ram Das Ji, Lord of miracles has blessed us with this beautiful Hukamnama. May we remember the raha-o lines throughout the day and may he bless us and we get addicted to the drug of God’s name.